Medievally Inspired Garden of Loudun : This garden displays the medicinal plants that make up the famous ”polychreston”, a medecine created by Théophraste Renaudot. The garden also has other plants, such as plants used for cooking and in medicine. 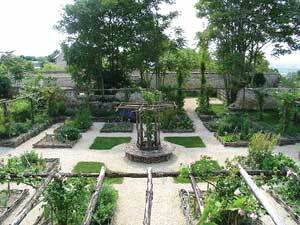 Squares made of braided chestnut trees, pergolas, and wooden bowers decoprate this garden, which also has fruit trees ! a visit to this garden will lure you into a world of pleasant and varied scents and sensations. Out-season : 2 pm. to 6 pm. Summer : 3 pm. to 7 pm.